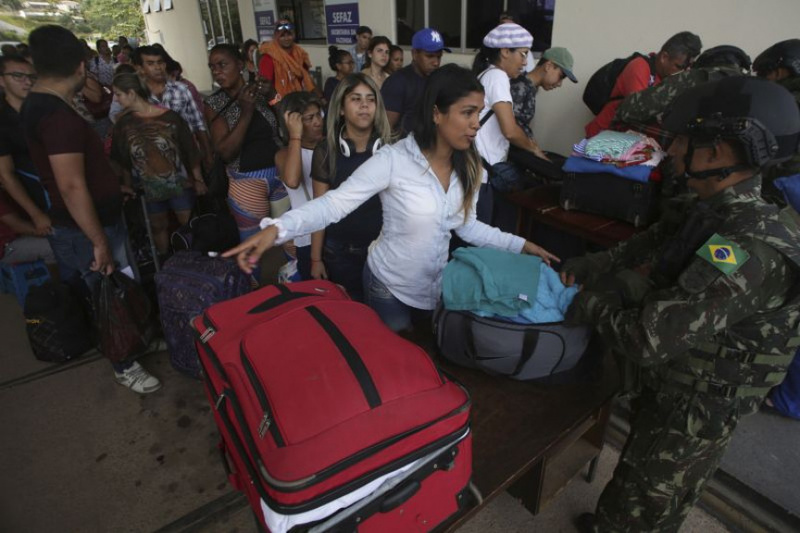 SAO PAULO (AP) — Brazil says it won't close its border with Venezuela despite tensions that led to attacks on migrants who had fled to the border town of Paracaima. Institutional Security Minister Gen. Sergio Etchegoyen said at a news conference on Monday that closing the border would be illegal and wouldn't help ease the situation in the border town. Residents of Pacaraima attacked Venezuelan immigrants on Saturday after a local storeowner was robbed, stabbed and beaten in an assault the Brazilians blamed on four immigrants. "The closing of the border is unthinkable because it is illegal," Etchegoyen said. "Brazil's immigration act says we have to take care of immigrants and refugees that arrive in this condition." Political and economic turmoil has driven tens of thousands of Venezuelans across the border, straining the capacity of small towns in the area to cope. About 510,000 Brazilians live in Roraima and 12,000 of those are in Pacaraima, a city that has received five times its population in Venezuelan refugees. Roraima state Gov. Suely Campos, who is in the middle of a re-election campaign, has pressured Brazil's federal government and judicial authorities to close the border with Venezuela or send enough help. Campos requested on Sunday that Brazil's top court temporarily suspend the immigration of Venezuelans into Brazil. There is no date for a court decision on the case, but a similar request was denied in April. "Unfortunately it took a violent episode for the federal government to understand it needs to face this issue in an effective way," Campos said in a statement on Monday. She is asking national officials for $45 million to compensate for spending made by Roraima state since 2016, when the refugee migration began to reach crisis proportions. In another document filed to Roraima authorities, Campos said there is risk of a "bloodshed" in Pacaraima and said "the chaos is a result of the omission of the federal government." "Future violent incidents of dangerous proportions to the country's national security could happen on the next days," the governor said, mentioning other cities of Roraima where Venezuelans have also arrived. Minister Etchegoyen, however, said closing the border "wouldn't help with the humanitarian situation in any way." Etchegoyen said the situation in Pacaraima has calmed since Satuday, but no arrests have been made yet. "Those people will take responsibility for their acts," he said. "Those that took part of that probably regret it now." Brazil's federal government is sending 120 military-style policemen to Roraima.